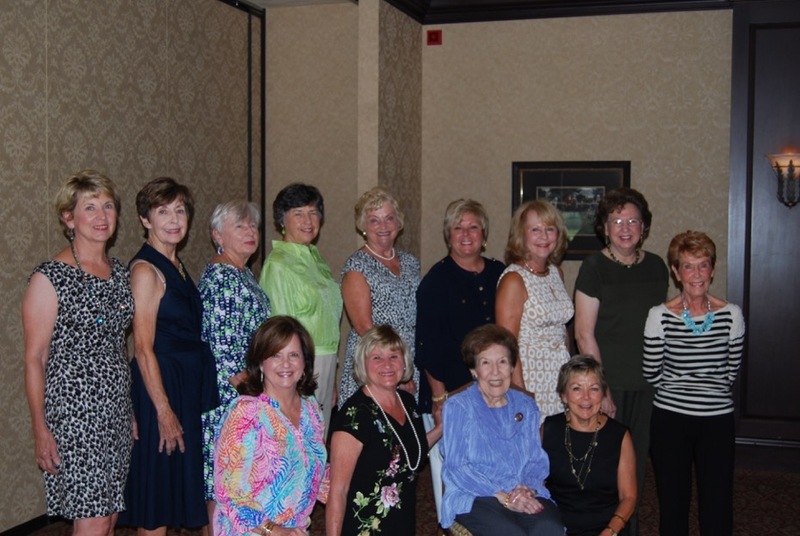 Over the past 30 years the Bermuda Run Garden Club has earned a reputation for excellence and leadership in community service not only in Davie and Forsyth counties but across the nation. A twelve time winner of the State Garden Club of the Year award and a national Shell Oil Environmental Awareness Award for starting the first recycling project in Davie county head the list. These contributions have been made possible by the hard work of many women who are and have been members of the club’s 30 year history. Founded in 1984 by the late Grace Maddrey along with charter members Ann Cornwell and Lois Price the club continued to grow with monthly meetings and town projects. Programs planned were a variety of fun and work with visits to Botanical, Wildflower and Herb gardens. Some projects were to benefit public parks while others were to beautify our area nearby. Workshops covered information and awareness of preparation for the first Annual Flower show. 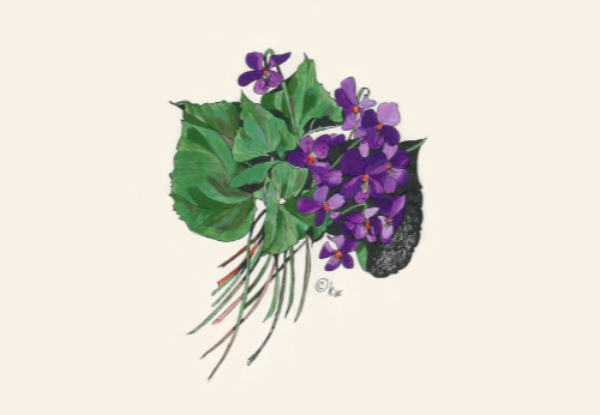 It was during this first year the club flower – violet- was chosen and member Katie Reidenbach presented then club president Ann Cornwall with an original watercolor rendering. 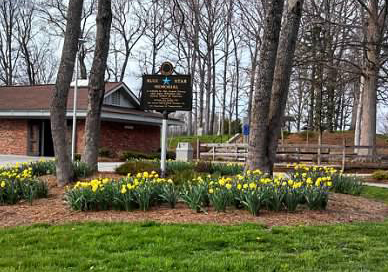 In 1987 a two year landscaping project around the Bermuda Run Post Office began. By the end of the first year the club had grown to 30 members. 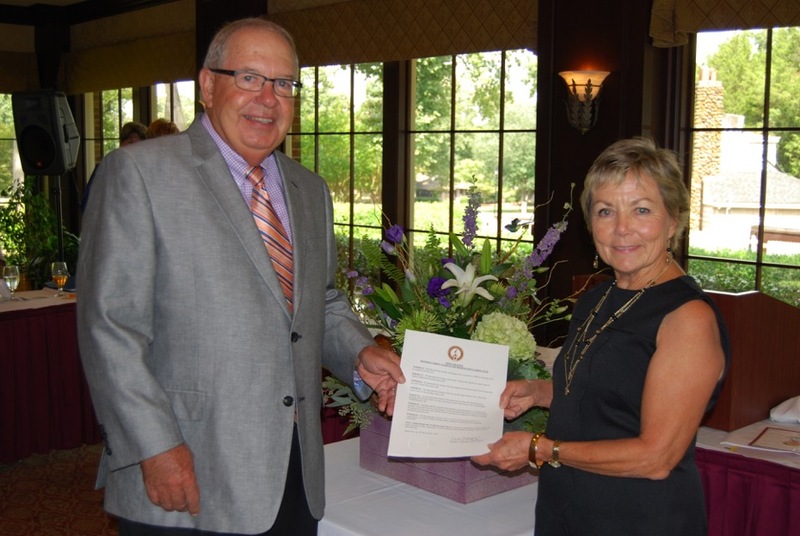 This past September the Bermuda Run Garden Club hosted its 30th annual anniversary luncheon on September 3, 2014 at the Bermuda Run Country Club. In addition to the two chartered members, honored quests included former presidents of the Garden Club, NCGC District 4 Director Marge Silber and Town Councilman Ed Coley. A formal proclamation signed by Bermuda Run Town Mayor Ken Rethmeier was presented by Coley declaring Sept 5th in our great town as officially “Bermuda Run Garden Club Day”. 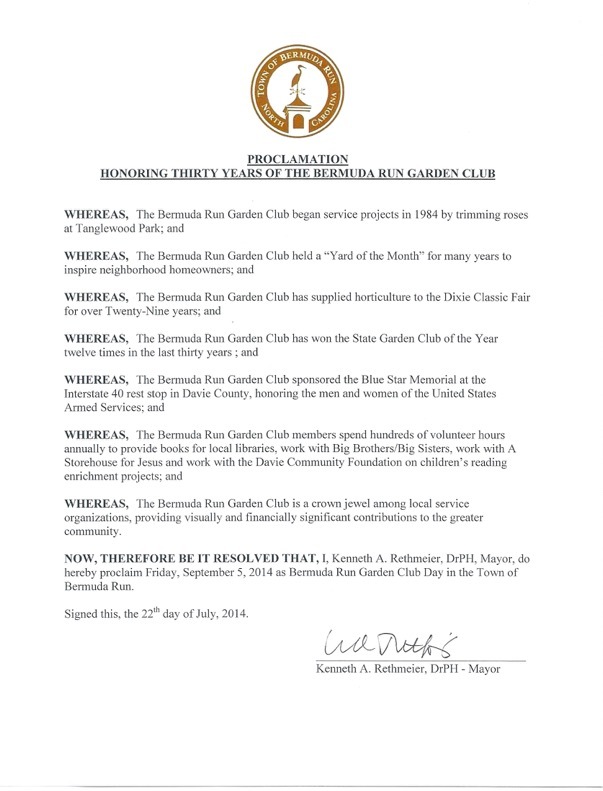 The proclamation honored the garden club for thirty years of community service. Projects recognized by the town included trimming roses at Tanglewood Park, establishing a ‘yard of the month” program to inspire beautification, supplying horticulture to the Dixie Classic Fair for 29 years, State Garden Club of the Year awards, Blue Star Memorial sponsor, and hundreds of volunteer hours to local libraries and charities.